Imagine this simple scenario. Let say you are trading Forex, Indices or CFD in your MetaTrader 4 account (let’s call it Master account (A). Then you also have other 10x MT4 accounts of your family members and your clients (let’s call them Client accounts B1, B2, B3, etc). All of them are running on your computer at home. Do you know you can link all of these MetaTrader accounts together and open positions in each of them at the same time? Even more, you can log into the same Master account (A) from ANOTHER computer (2) to execute trades there and have them replicated into each and every Client account running on the first computer (1). If you did not knew that, then it’s your lucky day because in this article I will explain how you can initiate trades in all these accounts by opening a position only once in your Master account (A). And not just that, you will also learn how to trade multiple MT4 accounts from different computer, which means you will be able to trade many accounts from your laptop while traveling. Many people think that it is not possible to do this, to trade MT4 accounts from different computer or device, but the truth is, it was always possible (at least for the last several years), but somehow not many traders talk about it. So here it is, here’s the secret (which is actually no secret) how to trade MT4 accounts from different computer. The thing is that MT4 allows to run multiple instances of the same trading account on several devices and computers anywhere in the world. This means you can have your MT4 account #123 running on your computer at home in United States and at the same time have the same MT4 account running on your computer in the office. Additionally, you can give the same MT4 login details to your account manager in Singapore and also give read-only account access to a friend from Australia. Now your account manager can initiate trades in your MT4 account in Singapore while you can see them in the very same MT4 account of yours on your home and office computers in United States. Also, your friend in Australia will be able to see your trades too. It’s really simple as that. All that need to be done is MT4 platform installed and the same MT4 account login information entered in all of these MT4 instances. Now the real magic begins when you can actually repeat the same trades you see in your MT4 account on your computer, to many other MT4 accounts of your family or friends. Why would anyone want to do that you might ask. Well, for the sake of this example let’s say your account manager in Singapore generates you 20% profit every single month on average, but he also takes half of your profits in exchange for the service. This is normal and it is called profit sharing. So you get to keep only 10% of the profit. Now let’s say you have other 10 people who are ready to invest into Forex and get their account managed by the same trader in Singapore. They would all have to pay 50% of profits every single month, but not if you will be the person who’s managing those 10 accounts. In that case you are the one who can take half of profits from each of those 10 client accounts. All you need to do is to copy all trading actions from your MT4 account managed by the Singapore trader to those 10x MT4 accounts of your family and friends. Sounds simple, right? Well, the truth is that it is simple. Really. Here’s what you need to copy trades between multiple MT4 accounts even if the main MT4 account is managed in another country on another computer. First you need to install multiple MT4 platforms on your computer. It can be a laptop, your desktop computer at home or your office. It does not matter. But if you are really serious about the process then you will need a computer that can be online 24 hours a day every day. This is called VPS server, which in other words is your private virtual computer on the internet. Then you need to have a special add-on software for MetaTrader 4 platform which is usually called trade copier or account copier. The last thing you need is to setup everything on a computer that can be online 24 hours a day. Basically that’s all you need to do. When you have such setup you can even manage trades in your MT4 account (A) from any other computer you want. It could be a computer in your office or your laptop or it could be your smartphone. Yes, that’s correct, you can open a trade in your MT4 Mobile app on your iPhone or Android and have the same trade appear on all the client accounts you’ve setup. Let me explain the process in detail, but before I begin, you should already know that you can install multiple MT4 platforms on the same computer. If you do not know how to do this then let me give you a short explanation. Installing several MT4 platforms on the same computer is easy and the best part about this is that you can have multiple platforms even if they are from the same broker. The trick is simple. 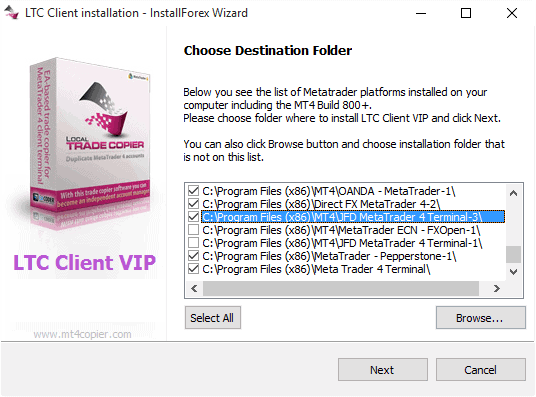 All you need to do is to repeat MT4 platform installation 11 times on the same computer (following our example above to install one master account (A) and 10 client accounts B1, B2, B3, etc). Simply initiate MT4 setup and set different and unique installation location for each of those platforms. This is done at the very first window of the MT4 installation wizard like illustrated in the picture below. Not sure why, but I’ve seen many people miss the SETTINGS button for some reason and clicking NEXT button instead. 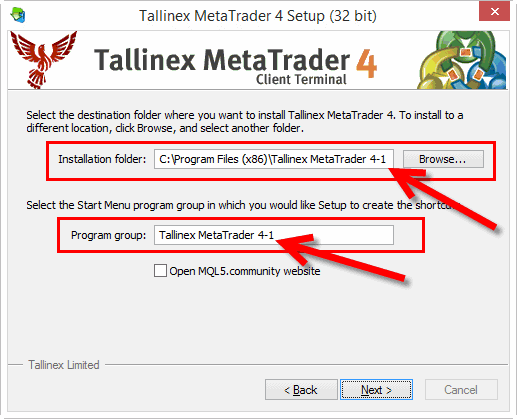 In that case you would not get an option to choose a folder for your MT4 installation. You need to click the SETTINGS button and once you do, you will get to a next window which looks like the one below. Usually I always add numbers at the end of the installation folder name and program group name. This allows you easily to identify each MT4 platform later. Now when you’ve installed several MT4 platforms on your computer and logged into MT4 accounts on each of them, you will need to install a software called Local Trade Copier. Local Trade Copier is a special add-on for MT4 platform created by Rimantas Petrauskas, which allows you to replicate the very same trading actions on many MetaTrader 4 accounts simultaneously. 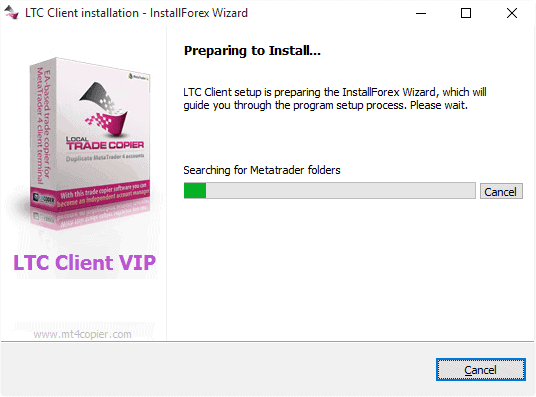 LTC comes with a special auto-installer so it is very easy to install it on any computer. This means installation can be done instantly on all MT4 accounts at once. LTC installation is done in two steps. First you install LTC Server EA, which will be reporting of any trading actions happening on the master account (A). Second step is to install LTC Client EA, which will be listening to any notifications from the Server EA and repeat the same trading actions on all MT4 client accounts (B1, B2, B3, etc) as they happen on the master account (A). Installation process is the same for LTC Server EA and LTC Client EA, the only difference is that you execute different auto-installers included in the LTC package. Below I will illustrate how LTC Client EA installation looks like. Once you execute the LTC Client EA auto-installer you will see a window like the one below and your computer will be scanned to find all MetaTrader 4 instances. The next step is to choose all the MT4 instances where you want LTC Client EA to be installed to. In other words, you want to choose all the MT4 client platforms on the list (B1, B2, B3, etc) where you will want trades to be copied from the master account (A). Once NEXT button is clicked auto-installer will install Client EA into each of the MT4 platforms selected. This is very handy because you do not need to copy any files to all 10 of the client platforms manually. Obviously you also need to install LTC Server EA, but because the installation process is the same I would not go into details here. The only difference is that you would execute auto-installer of LTC Server EA and choose only MT4 master account (A), or any other MT4 platforms you want to act as master accounts. Now that we have installer MT4 instances and Local Trade Copier, we can already start the process known as “trade copying”. In order to start copy trading process you will have to start the Local Trade Copier. First, open EURUSD chart window of any timeframe and then double-click on the LTC Server EA which will appear in the Navigator window of the MT4 master account (A). What you need to do is to attach the Server EA to the EURUSD chart window. Important to mention that even though Server EA will be attached to the EURUSD chart window, it will still monitor all the trades on the MT4 account from any other instrument including CFD, Indices or any other symbol available in the “Market Watch” window. 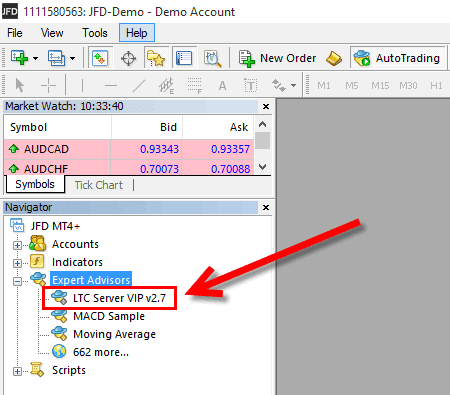 Second, repeat the same procedure for each of your MT4 client accounts (B1, B2, B3, etc), but with the LTC Client EA. 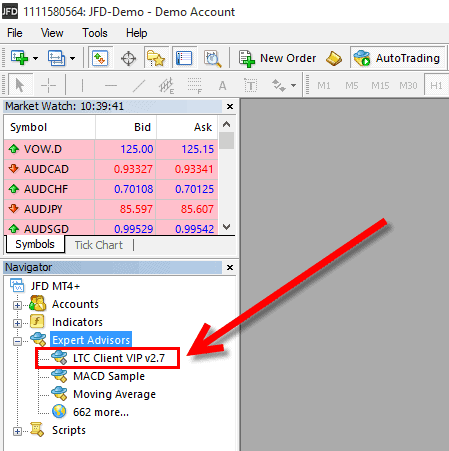 Simply switch to each client account one by one, open EURUSD chart window of any timeframe and double-click LTC Client EA which will also appear in the Navigator window of each of the MT4 client accounts you’ve installed a moment ago. So now you have a Server EA running on the master account (A) and 10x Client EA instances running on 10x MT4 client accounts (B1, B2, B3, etc). The next step is to open a position on the master account and see how it is replicated to each of the client accounts at the same time in less than a second. If something goes not as expected you can always read MT4 messages in the Experts tab which might help you identify the problem or the reason immediately. Simply open a BUY or SELL position on the master account (A) and the Local Trade Copier will copy it immediately all MT4 accounts running LTC Client EA. Obviously, if the trade is modified or closed, the LTC will repeat the same steps on all client accounts as well. LTC replicates each action exactly as it happened on the master account. Even if you close only a portion of a position or close all open trades running on the master account, the same will happen on all client MT4 accounts. If for testing purposes you do not want to open real positions you can always test trade copying process with pending orders. It’s very useful. Simply place a pending order far away from the current market price so it won’t get triggered (assuming you do not want real transactions on your master account) and the very same pending order will get placed on all MT4 platforms that have LTC Client EA attached. In the example picture below you can see trade list from two MT4 accounts. Trade list at the top if from the master account and the trade list at the bottom is from the client account. A BUY trade was copied in less than one second to a client account at the very same price of 1.10097 on the EURUSD instrument. Both trades also have the same stop loss of 1.09102 and take profit of 1.11102. Once your account’s activity is ready to be copied to other MT4 accounts you can ask your account manager to begin trading. If you do not have anyone to manage your account I will mention that this will work if you generate trades on the master account (A) in anyway you like. I mean you can use some Expert Advisor to generate trades, or you can trade manually, maybe using one of my semi-automated trading tools like Trendline Trader EA. You can even setup your account to follow trading signals on MQL4 Market and copy them to other accounts. This is just one simple example of trade duplication. Local Trade Copier is the most configurable trade copier in industry so you will be able to setup advanced trade copying schema once you get to know the process well. If you spend extra 30 minutes reading Local Trade Copier instruction manual you will get to learn all of its settings and copy trades using advanced options like trade filtering, stop loss and take profit manipulations or reverse trade copying method. For those who have more interest in trade copying on MT4 platform I recommend reading this Definitive Guide to Forex Trade Copying. Your Forex or MT4 skills does not matter much, because trade copying process is much easier that you might think. 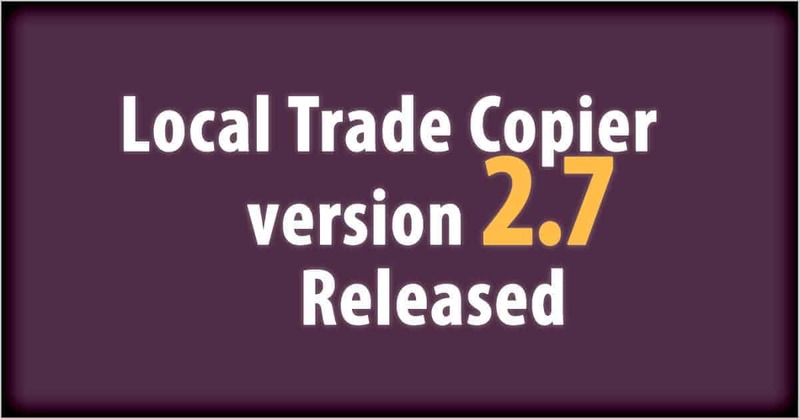 Even novice traders can begin copying trade in minutes, especially after reading this article or instructions included with the Local Trade Copier software. I am proud to say that the trade copying process today is available not only to people managing multi-million dollar accounts, but also beginner traders working with small MT4 accounts or even just starting with a practice account. Do all client Mt4 platforms have to be open or be on for the signal to copy to client accounts? Hi, yes, all MT4 platforms have to be open with LTC EA to copy the trades. Does it support Macbook ? Yes. Even thought I have created and tested LTC on Windows OS, I do have people who are using it on MAC. I personally did not tested it on MAC. But here’s what my customers sent me. These are the steps they took to install my EAs on MAC. 4. Download the installation files from EA-Coder.com Download Center. The link should have been sent to you by email after product purchase. 5. Install the EA into the MT4 platform. When installing EA, all the MT4’s installed on the virtual machine should be automatically detected for your convenience. 6. Customers said there were no errors during the installation and simply following the installation instruction manual did the job. How many accounts can this software handle, for each mt4 account + Vps server? Basing the case from one master account into slave accounts? Hi, it all depends on the VPS you have. Local Trade Copier is for copying trades between MT4 on the same computer. Signal Magician is for copying trades over Internet to your client MT4 accounts running on their computers. Say you are using local trade copier on a home computer with a master MT4 (A) and add family members and friends MT4 (B1, B2, B3) and your home computer is trading signals from a trader that you are paying monthly services fee to send you those signals to your MT4 master (A) automatically. Is it anyway, the trader would find out that your computer master (A) is feeding other MT4 (B1, B2, B3)? Yes, that will work with my MT4 Local Trade Copier and signal provider will not know that you are copying the trades. They have no way to know this. What can you do if, you have several accounts with varying amounts (say a Master with 100k, and 3 salves with 75,50,25k respectively), where you want to place the same trade on all the accounts but different lot sizes. Say you wanted to do a 4 lot/contract on master, 3 lot on 75, 2 lot on 50, and 1 lot on 25. Is that possible with this? Hi, Local Trade Copier will automatically calculate the proper position size according to different account sizes. You also have an option to control how this is calculated, for example set higher or lower risk for individual client accounts. Watch this video for details about trade copier risk parameters. so are you saying, for example….if you have say 3 vps, and you install the same mt4 account on the 3 vps. i.e you are running the same mt4 account on 3 vps with an EA for example…..every trade taken would be tripled automatically?? Gabriel, if you run 3x instances of your MT4 account on different or the same computer and have your trading EA attached to each MT4 instance, then you will get triple trades. There’s even a chance your EA will go nuts and start doing unpredicted things. To avoid this you need to run EA only on a single instance of the same MT4 account. In this case, you won’t get triple trades and each MT4 account instance (even on different machines) will show the same trades. Yes, that is possible if you are using MT4 trading platform for that. Does this require a memory upgrade to the computer? Normally it does not, but I don’t know what computer you have. 1 GB of memory should be enough for 2 or even 4 instances of MT4 terminals with a trade copier. The reaseon is that I want to generate signals based on the chart from one broker (forex) and send order as binary option to antother broker who allows on binary option orders using MT4. Currently my account manager handling all the trade and login. If i installed the LTC, any posibility he will notice? No, if you install LTC on a different computer and won’t tell your manager about it he will not know. Hi I am a copy trading provider and I want to know if I can connect over 200 clients account to one master account in the same computer and do I need to install 200 mt4 to do this? Secondly if I host a VPS and maybe my laptop or computer is off and I place trades with my phone can it still be placed in the 200 accounts? Hi, yes, you can connect 200 accounts and you will have to run MT4 terminals to do that. It is better to use http://www.signalmagician.com for this because those 200 MT4 terminals then can be running on client computers. You can open trades form mobile MT4 App and have it copied to all 200 client accounts. Thank for sharing…its very helpful. I should use your software to access multiple mt4 accounts to generate only a detailed daily report for each one and then import all the results into a database, without making any trade. Not really. You should use http://www.MyMT4Book.com to get stats of your trading results on different MT4 accounts. Hi how i pay the master trader if my account is links to his account, does he have access to my account, can he make withdrawals to pay himself? No, master trade does not have access to your withdrawals. You have to pay him through PayPal or bank account, etc. It is for you guys to decide. Can I copy trade from mobile mt4platform?